Parents are their children's most powerful Jewish teachers. When you learn with your children, you are a model for lifelong Jewish learning. These special times together are milestones in the life of the child and have a positive impact on family life. With this in mind, the JCCs of Greater Toronto is launching PJ Plus, a groundbreaking concept in family-based Jewish education. PJ Plus builds on the overwhelming success of PJ Library, using PJ Library books as a springboard to develop engaging and inspiring sessions to enhance the educational development of the young child. PJ Plus is a child/parent learning experience, where the fun of a playdate meets the value of Jewish family education. • Classes for 18 months to 30 months (9:30 am-10:45 am); and 2½ years to 3 years (11 am-12:15 pm) What’s the Plus in PJ Plus? • Programming where young Jewish families can connect with one another in a warm, welcoming, inclusive environment. • Information about services and programs within the Jewish community including options for ongoing Jewish education. • Strategies to bring Jewish family learning into your home. • Two children’s books on Jewish themes for your child to keep. The Spring 2014 session weave Jewish values, holidays, love of Israel and elements of Hebrew into the classes. The PJ Plus curriculum for this session has a special focus on Passover, Shabbat, caring for animals, visiting the sick and environmentalism. JCC members: $170 per family/session; Regular fee: $180 per family/session. PJ Plus sessions take place at the Schwartz/Reisman Centre (SRC) on the Joseph and Wolf Lebovic Jewish Community Campus and the Prosserman JCC on Sherman Campus. 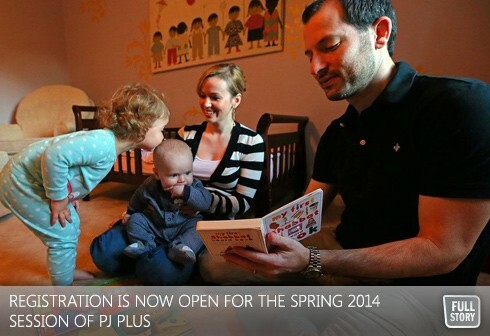 Registration is now open for PJ Plus! Contact Adina Lipson, PJ Plus Coordinator at (905)303-1821 x 3258 or adina@srcentre.ca. PJ Plus received seed funding from UJA Federation’s Centre for Jewish Education WOW! Toronto Initiative.